For what seemed like the 100th time that night, I looked at my watch – 1:00 am and still an hour and a half before I was due to get up. It was no good, I couldn’t wait any longer! I got up, showered, got into my running kit and had breakfast (or was it a late supper) had a final check of my kit and I was off. I had decided to drive to the finish and take the 5.00am shuttle bus back to the start so I would have my car to collapse into at the end of the event rather than drive to the start and rely on one of the shuttle buses to take me back to collect the car the next day. (It’s worth booking up the shuttle bus & car park early as I know it sold out quickly this year and a lot of people were disappointed). The finish area is based in a large farm and was well sign posted with a large car park in the field where I was able to hole up until the bus arrived at 5.00am. As I thought about the challenge ahead I used the time productively t0 study the maps and have yet another peanut butter sandwich. 2 hours later and the bus arrived at the start in Chinnor where already several hundred people had gathered. Collecting my race pack was really efficient and the shear scale of the challenge finally hit home as I looked at the 6 pages of maps. As it turned out, the event was really well marked out and even the night section was pretty clear so fortunately I didn’t need to resort to the maps too much – just as well with my map reading prowess! 8.00am on the nail, the hooter sounded and we were off – the adventure had started! I had sent myself a target of 20 hours although secretly I hope to finish in under 17 hours. I knew that I should start off very gently, keep to my own pace and not get carried away with the excitement of what was going on around me – easier said than done with 500+ runners champing at the bit. Although the weather had been glorious leading up to the event, some pretty extreme weather had been forecast and already the paths were quite muddy as we made our way across an amazing poppy field (this is the one you see on all the pictures) towards the first check point. The checkpoints were really well laid out, contained all kinds of goodies for the hungry runner and were approximately 10km apart so there was always something to aim for (this became more important as the race unfolded). I was feeling good by the time I got to Goring about 21 miles in. The going had been quite muddy underfoot but my feet were dry, no blisters and atrocious weather forecast hadn’t materialised – just some light drizzle early on before turning hot and humid. Suitable refreshed at the second pit stop, I crossed the bridge and climbed the hill out of Streatley to rejoin the Ridgeway path and along Blewbury down towards Grim Ditch – another one of the many famous landmarks on the course. As we were approaching the half way point, despite the heat and humidity I was still feeling strong – 7.5 hours for the first 48k and I was looking good for my 17 hour finish – little did I know what was in store for me! I had got my hydration sorted out to coincide with the pit stops and I was still eating well. This was the overnight stop for some but the ‘non-stoppers’ ploughed on into the afternoon. Thunderbolts and lightning – very very frightening! 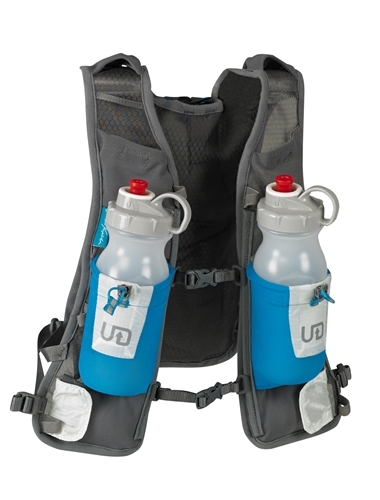 Despite waving goodbye to the overnighters, my spirits were still high – I was on track for a good time, no blisters, I was coping OK with hydration between aid stations thanks to my new Ultimate Direction vest but I was struggling to eat enough. However the next aid station seemed an interminable distance and I was starting to walk more than I wanted (my original plan was just to walk on the uphill stretches). Although it was now past 6.00pm it was still very humid and the thunderclouds were gathering and sure enough the heavens opened and I got drenched. Far to late I took shelter under a tree and donned my waterproof top. On reflection I should have sheltered until the rain and hail subsided a bit but I was determined to plough on which proved to be a costly mistake. By the time I reached the next aid station I was wet through and worst of all my socks and feet were soaked. I had spare socks and a spare top in my sack but fatigue plays tricks on the mind and I decided to keep going. The landmarks came and went – Uffington Castle, the White Horse, but by now I was oblivious and what’s more it was dark. The terrain was treacherous under foot with the earlier rain and the paths were pitted and cratered with the runners that had come before me. The pit stop crews were fantastic though, always offering encouragement and making sure that a hot drink, porridge or other goodies were on hand. The fellow runners were great too each of us looking out for the other and urging each other on. I could feel the blisters on the soles of my feet but decided against having them dressed – nothing was gong to stop me now! It was past midnight, although my Suunto Ambit had long since packed up, and I estimated I still had 15+ miles to go. But the something strange happened – the moon had come out from behind the clouds and it was a warm, pleasant night and, despite the enormous blisters, I was actually starting to feel good again! I could make out the torches in a long procession behind me and the whole thing was rather surreal. I kept on seeing dark shapes running in front of me and into the bushes and hundreds of eyes looking at me ( I later worked out these were cows – the dark shapes – well who knows). So now I was hallucinating and could call myself a proper ultra runner – the whole adventure had been worthwhile ! Suddenly I was within touching distance of my goal – I completed the mandatory 3km loop around the stones before heading towards the farm, the finish line, my medal and what I knew was the last remnants of my peanut butter sandwich from the day before. I had done it – I was a 100km ultra runner and this was just going to be the beginning! There is a very tired video on YouTube for you to enjoy! Pingback: Race To the Stones – one more time!